Tulip & Flower fields GPS Audio tours, 100% electric. Join the fun! Enjoy a drive it yourself trip through the famous Flower Bulb region with the Tulip & Flower fields GPS Audio Tour of Renzy.nl. In a 100% electric 2-person Renault Twizy, with GPS navigation and audio guide, you can explore one of the most beautiful and colourful regions of the Netherlands at your own pace. € 65,- for a 90 minutes GPS audio tour in 1 Renault Twizy, suitable for 2 people. The tulip and flower fields tour is available from 19 March to 19 May. We are open 7 days a week and offer 4 departure times per day. The best time to visit the tulip fields in gorgeous bloom is from the beginning of April to mid-May. But it is and remains a natural product so we never know 100% sure when the tulip fields are in bloom. Visit the magical tulip fields off the beaten track! "We booked the tulip & flower fields tour at Renzy.nl and it was really great! It made our visit to the bulb region extra special. You can get off at any time and see & experience the fields up close. Highly recommended!" 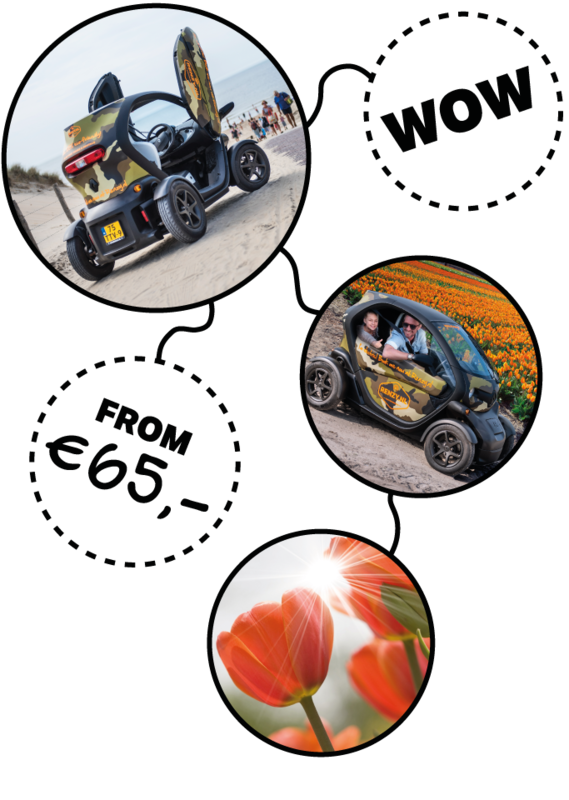 Renzy.nl offers a unique customer experience to discover and experience the Dutch landscape & small historical cities off the beaten track in a 100% electric Renault Twizy. All of our Twizies have a GPS Guide with detailed maps on board that guide our users along the route. The audio guide tells all ins and outs about the area and shares cool facts. So what are you waiting for, ride with us and join the fun!